Here is a composite image of the entire sky in radio frequencies. It shows data from Parkes, Jodrell Bank and Effelsburg (ie the “Haslam map“, technically for you astro nerds the Global Sky Model by Angelica de Oliviera Costa which includes some data from other observations) as well as point sources from the VLA in the north and Molonglo in the south. This version is suitable for a 10x20inch poster. Those stars aren’t stars! Each is a radio galaxy undergoing a cataclysmic event emanating from a central million solar mass black hole. The nearest, double-lobed Centaurus A, features prominently center right. 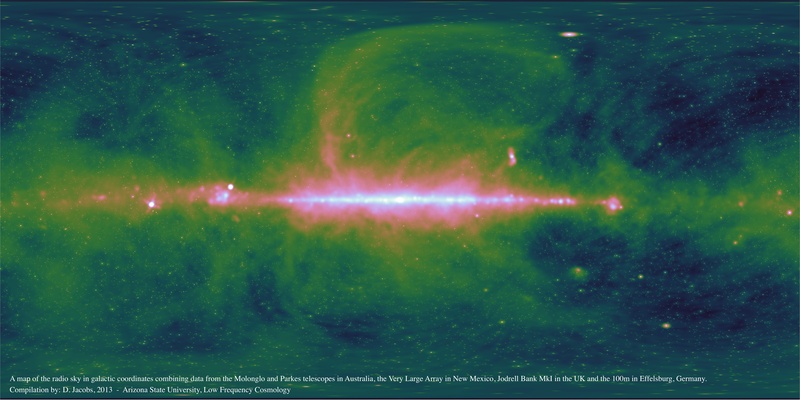 The radio Milky Way, a vast assemblage of supernova remnants, stretches across the center.